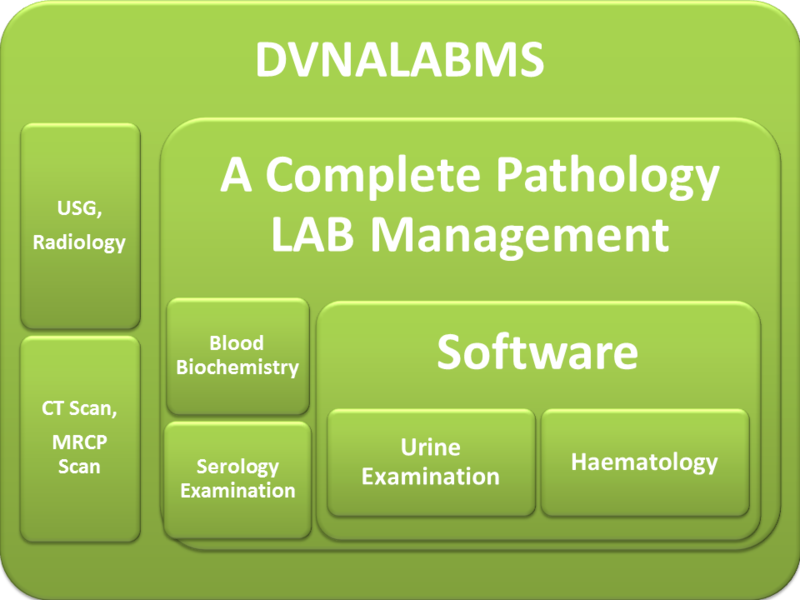 Dvna Pathology Lab, Hospital Lab Management Software (DVNALABMS) is a complete solution for Diagnostic Lab, Pathology Reporting, XRAY, and USG Reports. It is containing more features in comparison to DVNACLINICMS and DVNAOPDMS. It is keeping track on test reports from beginning to end which is not found in DVNAOPDMS and DVNACLINICMS. This is most popular and highly demanded Software in comparison to software available in the market. With highly driven technical excellence, our company is actively offering the best quality of Dvna Nursing Management Software (DVNALABMS) to the valued clients. Offered DVNALABMS is suitable for gynecologist, physicians, pediatricians, dentists and many more. In line with the set modern market trends, this Lab Management software designing service is imparted by our skilled professionals. It includes new ideas to manage reports quickly. This software service is widely demanded in hospitals, nursing homes and Pathology Lab. It has both type of patient management (OPD + IPD) facilities. These features are doctor panel, Patient medical history, patient surgeries history and social and preventive history, Vaccines, Cash Deposit, Final Billing, Email Alert, SMS Alert etc. We are providing free trial of DVNALABMS and customer`s support. This software is secured reliable and efficient. It is minimizing manual works and maximizing automated works by selection of few simple parameters. It is providing complete billing information i. e. Patient and Lab billing information management system. You can manage multiple billing cash counter in a single DVNALABMS software. After completion of registration procedure and successful verification. We will send to you, your free demo user name and password on your registered e E-Mail ID. DVNALABMS Module Includes Patients Management, Doctors Management, OPD Management, OPD Prescriptions, Child Vaccination, Billing and Invoicing and Reports. Key Features of DVNALABMS Patient’s Complete Demographic Details Overall Patients Data Management Automatic Operating at Reception OPD Prescriptions with Patients History Pre-scheduled Child Vaccination Table Commission Reporting Comprehensive Patient Billing Information Report Generation of Patients Records on Monthly, Weekly & Daily basis. Benefits of Using DVNALABMS Paperless Record Keeping User Friendly System Easy Information Sharing Flexible Reporting System Complete Data Security. A Centralized Patients records management system Accessible with Doctors & other Staff Members Easy & Customizable Data Entry forms Helps to run entire Hospital’s functions smoothly. DVNALABMS is including innovative ideas to manage patient quickly. It is suitable for hospitals, nursing homes and Pathology Lab etc. It is a web based as well as desktop application. It can be configured on local area network (LAN) or wide area network (WAN). It is containing Employee-History-Grid-Page, Family-History-Grid-Page, Females-Gynecological-History-Grid-Page, Illness-From-Which-Family-Member-Grid-Page, Patient-Currently-Being-Treated-Grid-Page, Patient-Has-Been-Treated-In-Past-Grid-Page, Patient-Medical-History-Grid-Page, Patient-Surgeries-History-Grid-Page, Reporting, Social-And-Preventive-History-Grid-Page. What is Doctor Panel in DVNALABMS? It is a summarized patient queue list and patient visited status data view of same day booking and advance booking for doctor visit. It is containing data filtering facilities with date wise of advance booking and same day booking. Visibility of data is depending on user’s role and responsibility. Whenever Administrator role or reception role users will login then they can see all doctors patient queue list and patient visited status on doctor panel. But in case of doctor role. Doctor can see their own patient queue list and visited status. Doctor can’t see patient queue list and patient visited status of other doctors. So this panel is highly secured and user friendly. 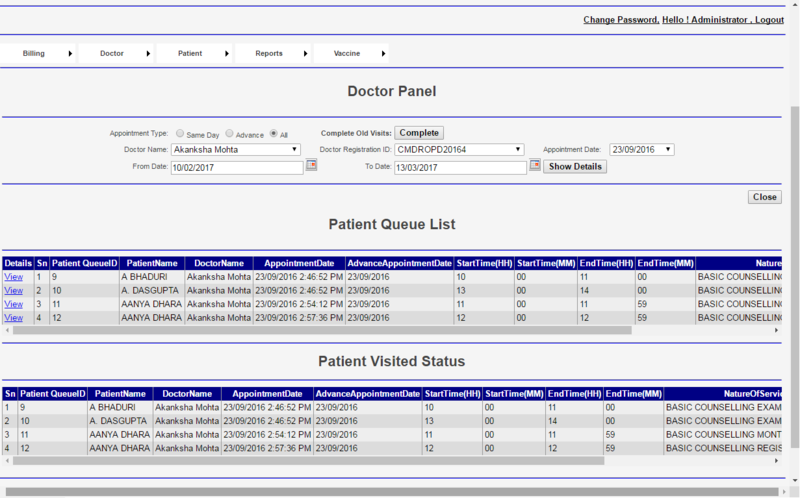 Easy to monitor of patient queue list as well as patient visited status. How To Register A Patient In DVNAOPDMS?